When you think about multi-passenger side by side vehicles it is becoming clearer that there is a need to haul more people on your adventure with you. Many manufacturers have begun to really ramp up their offerings for this market and Yamaha has also joined the rush for more people room. Introducing this bigger and longer rig for the 2014 model year, Yamaha’s Viking VI is a 6-person rolling workhorse that is ready for a hard day on the ranch. 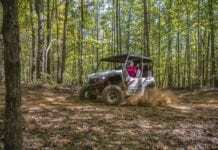 Known for its working demographic, Yamaha’s Viking was the first in many farm or ranch capable machines from the Newnan Georgia plant but not the last, as Viking VI makes its way into the off road world. Our first encounter with the Viking six was in the town of Austin Texas and even though it was a short visit the machines capabilities seemed obvious. 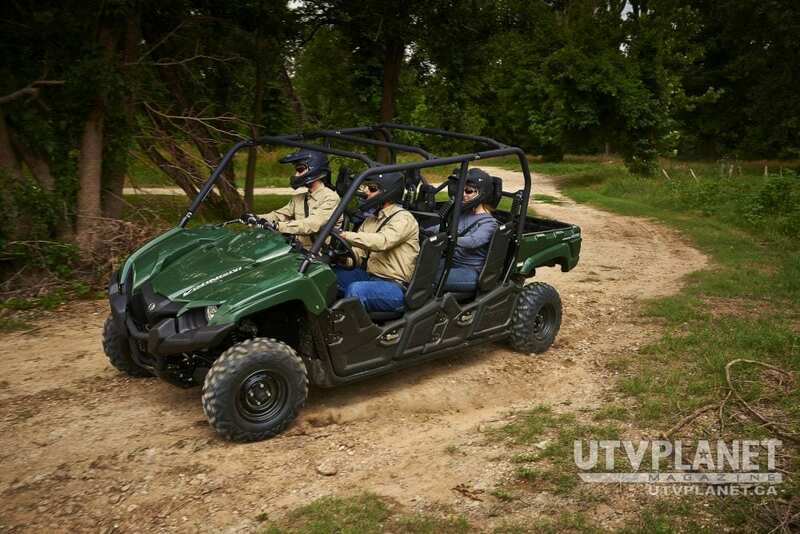 It was at the Hyatt Regency, just outside of Austin, that Yamaha would introduce us to the new 2015 Yamaha Viking VI. Built for comfort and mobility that gives you enough room to haul the tools to the job as well as the manpower to finish that same job effectively, the Viking VI is a working machine. Some would say spreading the machines wheelbase and getting another row of seats was all Yamaha had done, but it wasn’t just a job of adding three more seats. It was more of an engineering goal to provide ample safety as well as a smooth ride for everyone inside. Seating for each of the six passengers is very individual as every sculpted seat contours to its passenger to give the support needed for long days of riding or rough terrain. Just like the front seats, the center passenger is situated rearward just enough to clear the shoulders of the left and right side passengers. Just like the original Viking, each seat has its own three point harness to keep everyone safe. The front seat head rests are hollow, which rear seated riders can appreciate, as it gives optimal viewing of the trail in front of them. Raising the seating in the rear up 25mm will also lend to a clearer vision of the ride ahead. Floorboard space for the Viking VI is ample in front and rear with benefits from raised tread embossed in the flooring to give the confidence along with grip needed for the rider to feel safe. The Viking VI has a pass through design, which allows riders to exit on either side while passing through the middle of the cab. This well thought out feature is included in both the front and rear seating areas. There is also generous amounts of storage space as well as a sealed storage container for the SE model Viking VI. In order to make the Viking VI platform work like it should, adjustments to the drive train and other components were in order. The gas burning engine, a 686cc 4-stroke, liquid cooled, single overhead cam power plant in the 2015 Viking VI received an intake system that is longer because it now has to travel through a longer chassis before reaching the throttle body. In order to keep the air coming in at a good volume, the air filter size has been increased and fuel injection mapping has been adjusted for the Viking VI as well. Liquid cooling for the four-valve engine was increased as well and this should keep the four-stroke running efficiently on those hot days on the job. In yet another sensitive area for the Viking VI, Yamaha’s Ultra-matic fully automatic belt driven transmission received calibration adjustments. This was done to handle the added weight and cargo capacity. This very dependable clutch system has been around for many years and proven itself many times over. 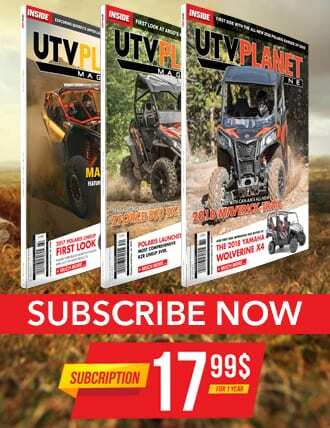 Keeping this off road vehicles capability in mind and also when the terrain gets a little rougher, Viking owners are given an option of 2WD, 4WD and 4WD fully locked front differential. This means when the trail or terrain gets slick, rocky or steep you can engage a little more help from the driveline. Strengthening the chassis was important to Yamaha as well and one way of doing this was by adding gusseting to the A-Arms. Another feature we found interesting was the raised underbelly of the machine from the center section out to the sides of the Viking VI. Offering Viking VI owners the best possible trail clearance, the undercarriage sides have been raised 60mm upward to make high center sticking on trail debris a little less likely. The original Viking has this feature and it is also worth mentioning that the covered underbelly slips over obstacles with ease. One concern of course when driving such a large vehicle and the potential weight you could be hauling is the braking system. 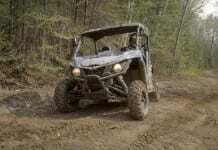 Whether you are riding the fence lines or trails, any machine of this caliber requires great brakes. Yamaha has added thermal shims to the very effective dual piston calipers to help aide in brake pad cooling as well as assist in lowering fluid temperatures to maintain a proper pedal. With the grip of the dual piston calipers and Maxxis BigHorn tires combined, getting the machine slowed is not an issue at all. Yamaha worked with Maxxis to develop this tire specifically for the Viking VI so it would perform at its best with the added loads. After our proper introduction by Yamaha staff, it was time to get in and close the door on our Viking VI. As we mentioned earlier we had very limited time to develop an opinion on the new workhorse. With a simple twist of the key our fuel injected Yamaha Viking VI came to life. Our Viking VI was equipped with Electronic Power Steering, which is an optional add on for the Viking. In my personal opinion it would be well worth the extra coin to have it on the heavy hauler. We hit the trails which had been cut out on the Hyatt Regency’s property. After only a few minutes it was very apparent that we may already be familiar with the vast majority of this rigs features. 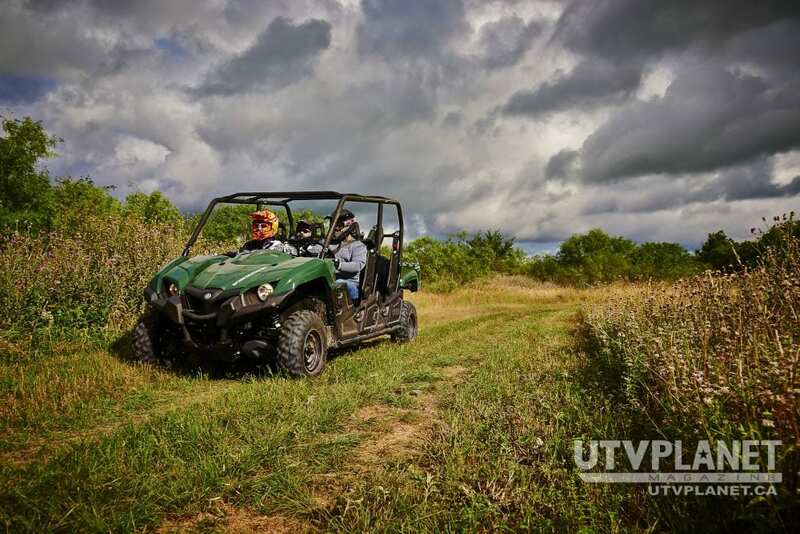 In the trail’s twists and sharp corners under power the Viking VI rolled right through without any trouble. The turning radius seems tight for a larger ride like this and chassis roll under power was limited even though we had three to four onboard. We felt the power of the 686cc four-stroke is ample for the loaded cab yet we did not have a chance to really weigh down the machine with passengers and heavy amounts of towable cargo. The electronic power steering on our Viking VI worked well inspired confidence in each handling situation leaving us in control of the machine. Sitting in the center front or center rear I felt right at home and the handholds seemed to be placed well enough in reach without to far of a stretch for most riders. Sitting left or right of the center in the rear seats brought to light the front seat shoulder bolsters framework attached to the rear of the front seats that seemed to dig into my knee, being a taller passenger, at times. 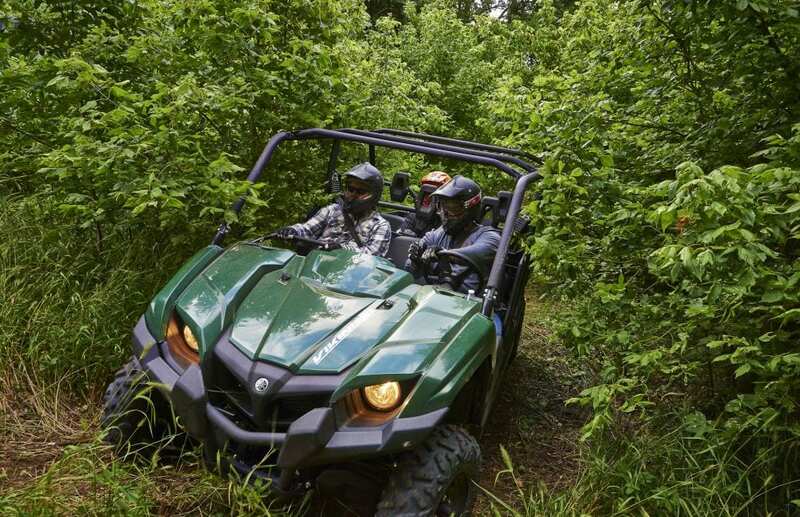 With its extra passenger capacity, this 2015 Yamaha Viking VI will make a great asset to the hard working world and even the trail rider. Taking into consideration what it was really built for it is even fun to drive regardless of its working stance. Testing out the four-wheel disc brakes I can tell you with confidence that with at least three more people in the cab the brakes work surprisingly well while maintaining control in the process. The purpose for the Viking VI is to provide a hard working reliable machine to not only move people but to make it as enjoyable and safe as possible. 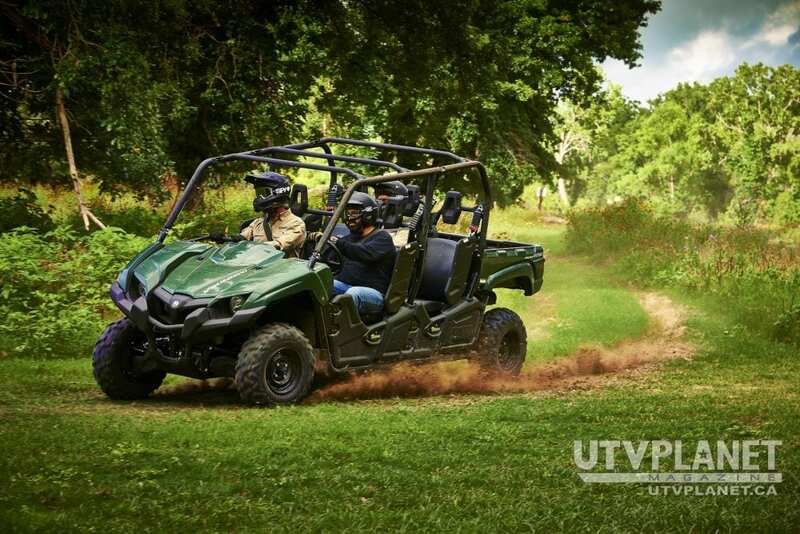 Yamaha’s newest flagship, The 2015 Yamaha Viking VI, is all about comfortable space. It allows the passengers to see the trail ahead and join in on the fun of discovering the outdoors whether on the range or on the trail. 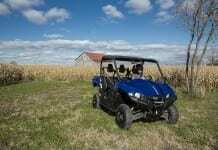 For more information on the Yamaha Viking, please visit Yamaha Motors.